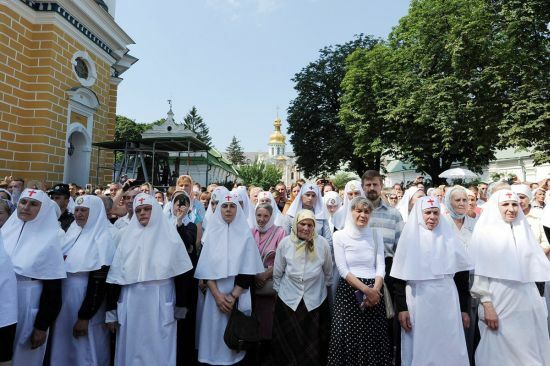 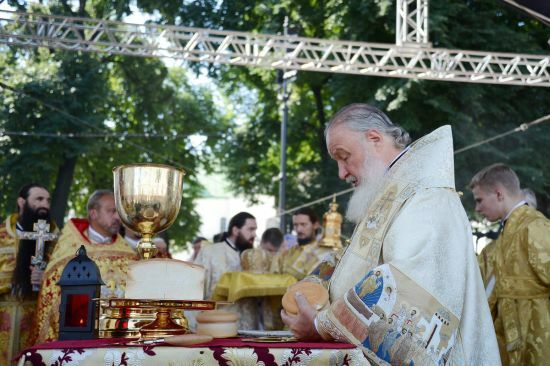 On July 28, 2012, the commemoration day of the Holy Prince Vladimir Equal-to-the-Apostles and the Day of the Baptism of Russia, a national holiday in Russia, Belarus and Ukraine, His Holiness Patriarch Kirill of Moscow and All Russia celebrated the Divine Liturgy at the Kiev-Caves Laura of the Holy Dormition. 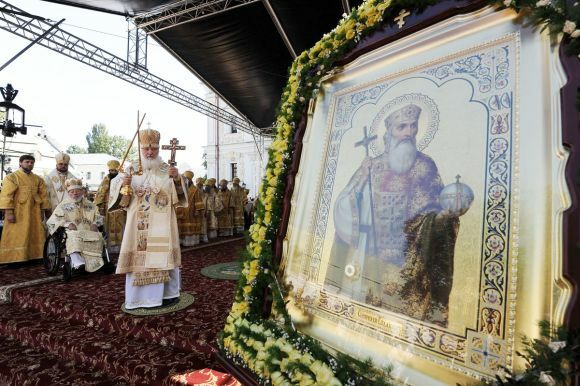 By the Russian Orthodox Church’s Holy Synod decision of July 26, 2012, it is also the Day of the Synaxis of the Saints of Kiev to be celebrated on the church-wide level. 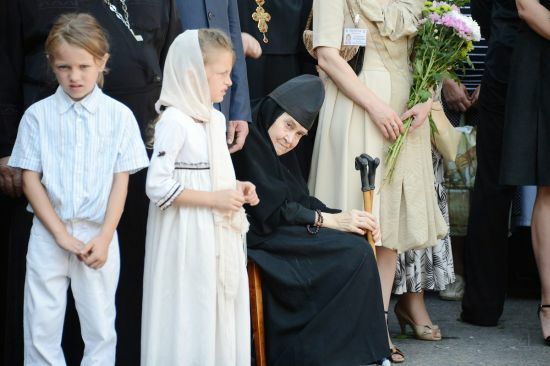 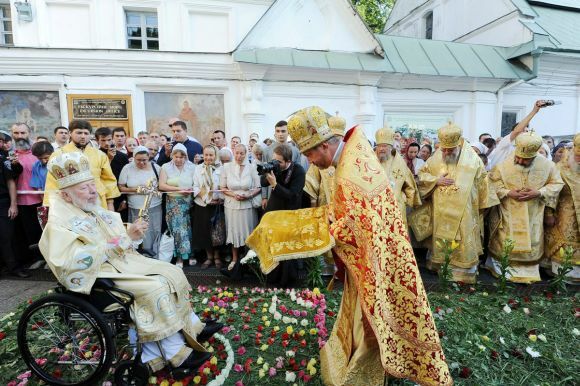 In addition, this year marks the 20th anniversary of His Beatitude Metropolitan Vladimir’s ministry at the chair of Kiev. 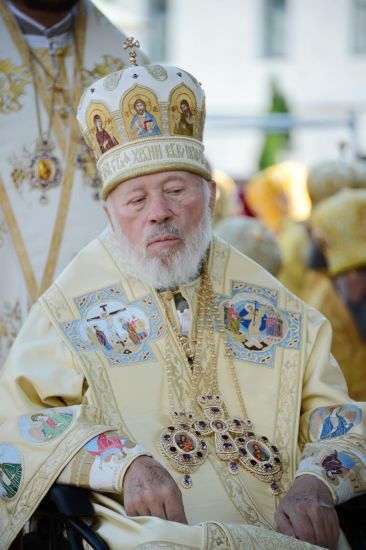 On May 27, 1992, in Kharkov, the Bishops’ Council of the Ukrainian Orthodox Church elected Metropolitan Vladimir (Sabodan) of Rostov and Novocherkassk as Metropolitan of Kiev and All Ukraine, Primate of the Ukrainian Orthodox Church. 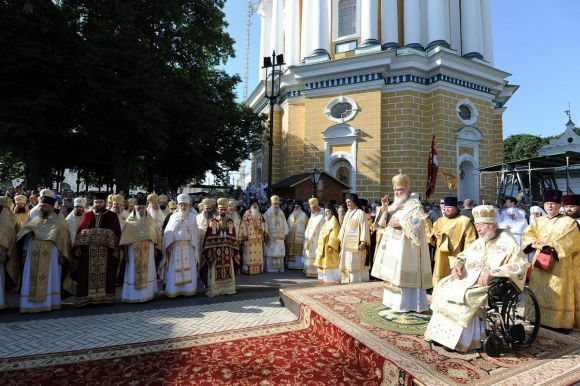 The Patriarchal liturgy was celebrated on the altar installed in Cathedral Square at the monastery’s Cathedral of the Dormition. 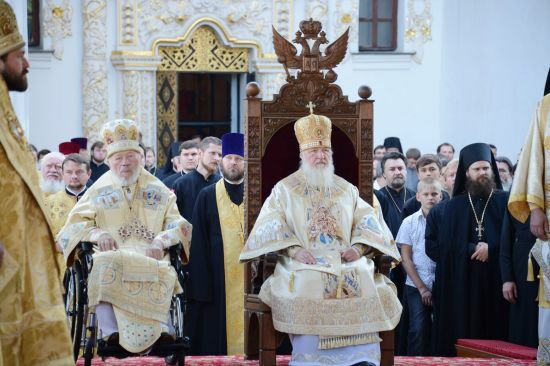 His Holiness was assisted by a great assembly of hierarchs including delegations of Local Orthodox Churches, among them the Patriarchates of Constantinople, Alexandria, Antioch, Jerusalem, Georgia, Serbia, Bulgaria, and the Orthodox Churches of Cyprus, Greece, Poland, Czech Lands and Slovakia, and America. 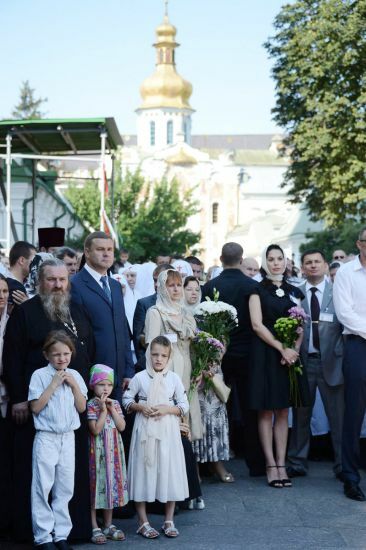 Present at the service were also Ukrainian state officials. 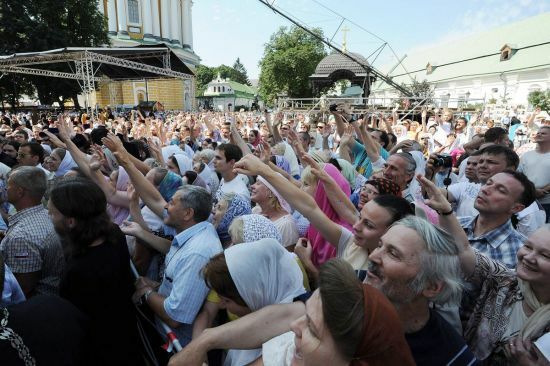 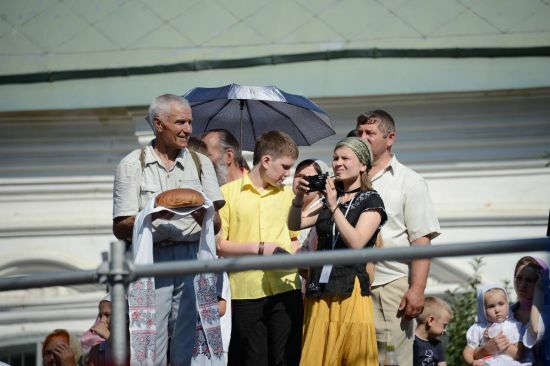 The service was broadcast by the Ukrainian television, with commentaries made in Ukrainian and Russian. 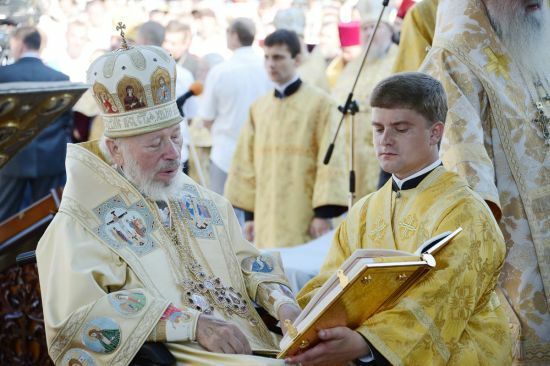 After the liturgy, the praises were sung to St. Vladimir. 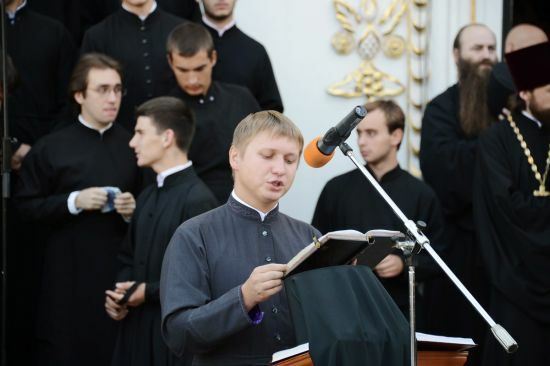 After that Metropolitan Vladimir delivered a homily. 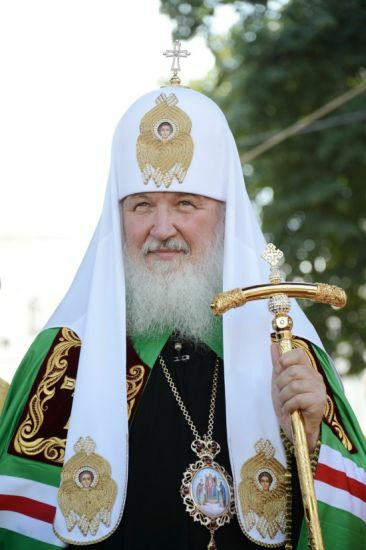 He said in particular, ‘Today we, led by His Holiness Patriarch Kirill, have been assembled by the Holy Prince Vladimir Equal-to-the-Apostles who cares for the salvation of our souls, so that we may not perish and may enter eternal life. 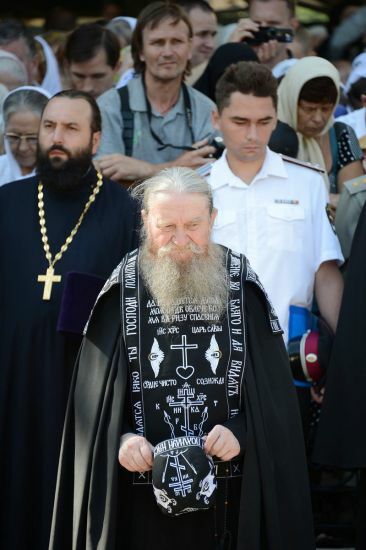 We wholeheartedly thank you, Your Holiness, for coming in order to strengthen our faith and to give us hope, which will help us to serve God with fear and to seek unity with Him’. 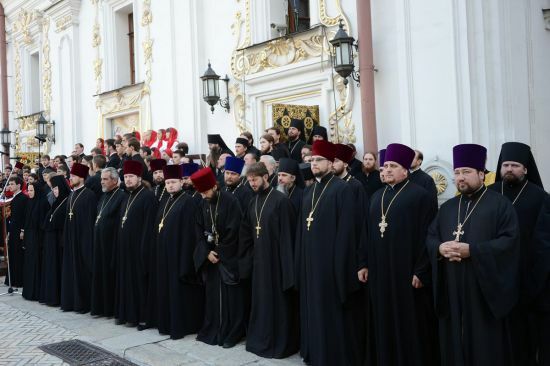 The Primate of the Russian Orthodox Church addressed the congregation with a primatial word. 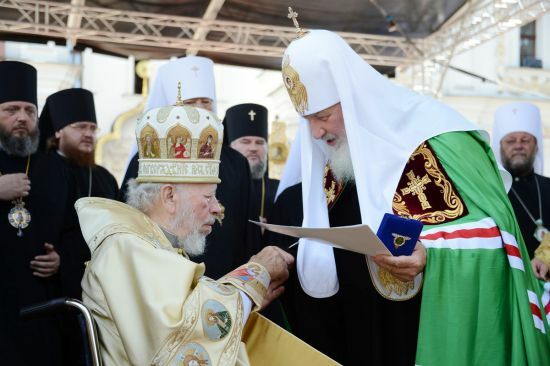 In recognition of Metropolitan Vladimir’s zealous missionary work and on the occasion of the 50th anniversary of his ordination and the 20th anniversary of his ministry at the chair of Kiev, Patriarch Kirill, awarded him the Order of St. Innocent, Metropolitan of Moscow. 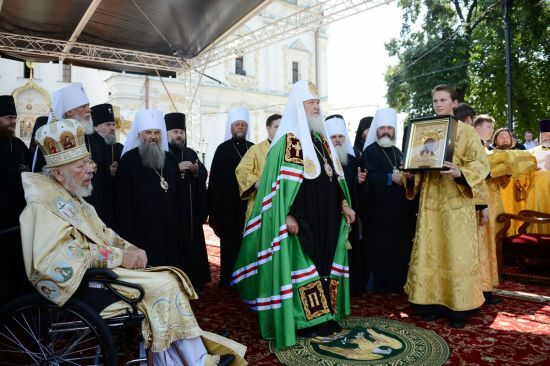 Patriarch Kirill also awarded a number of bishops of the Ukrainian Orthodox Church. 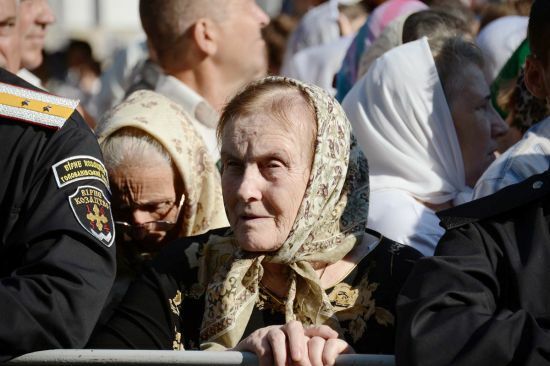 All the worshippers received little icons of St. Vladimir with the patriarchal blessing inscribed on them. 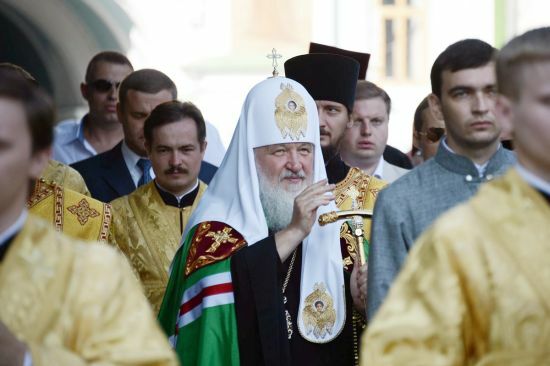 In the Cathedral of the Dormition, Patriarch Kirill gave his blessing to the participants in the youth school-expedition ‘From Novgorod to Kiev: By the Way of the Birth of Rus’, devoted to the 1150th anniversary of the Russian statehood. 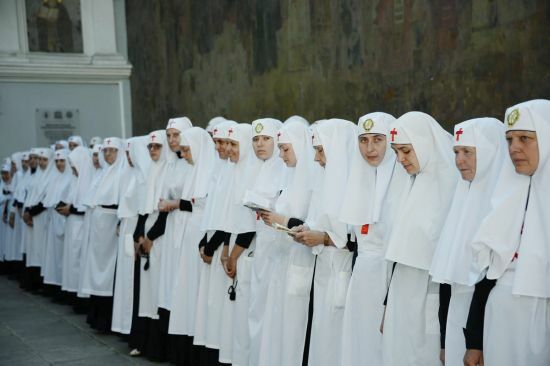 Organized by the St. Andrew the First-Called and the Center of Russia’s National Glory, this school involves young people from Russia, Ukraine, Belarus and France.